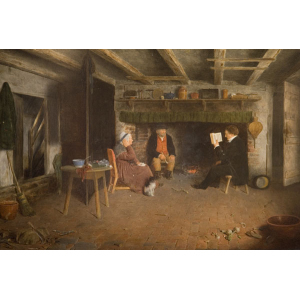 Summary: Oil painting showing an elderly couple sat by a range in a simple domestic interior. A visiting clergyman is reading to the couple. Description: This is an early work by FD Hardy and one of the first where he introduced figures. Although the figures are not particularly confidently painted, the composition demonstrates Hardy's skill for painting still life arrangements featured on the small table, on the mantelpiece and in the foreground. 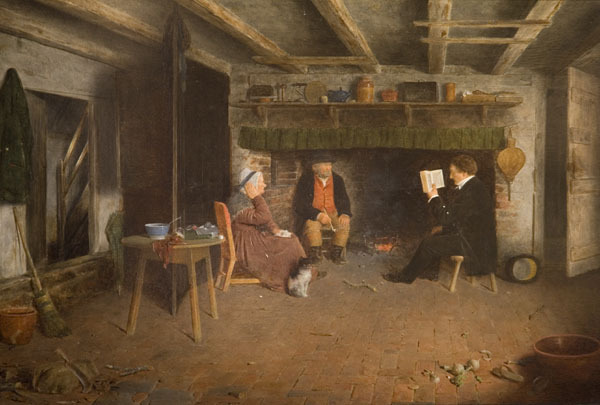 Description: A charming study of a clergyman reading to an old couple. The three people sit by the fire the couple's bare room. Although he did not attend the Royal Academy Schools, nor did he travel like his brother, Frederick is considered the most prominent member of the Cranbrook Colony.